Access and Inclusion is a three-year Public Health Agency funded programme to help make Arts and Heritage more accessible and inclusive for all in the community. The programme helps make the Council’s venues and activities more accessible for people with disabilities and to make people more aware of the support and services available. This has been done through the commissioning of access audits, setting up Advisory Groups, support at events and providing accessible workshops. Black Moon – a monthly disco for adults with learning disabilities. This event promotes independence and provides a safe environment to meet new people and have fun. 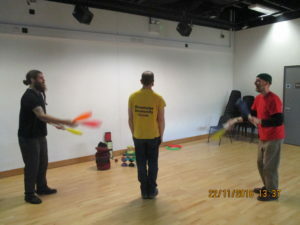 Circus Aurora Project – Streetwise Community Circus have received three years funding from the Spirit 2012 Challenge Fund to run accessible circus workshops for socially isolated groups. Fermanagh and Omagh District Council have been successfully chosen to be a partner for this project. Reading Rooms Project – This project is a shared-reading programme which brings people together to listen, laugh and discuss a short story and poem which is read aloud. DJ Training – 4 participants from the Enniskillen and Omagh Black Moon Events will be trained as DJ’s to help provide music at the events and help other participants learn the skill too. Awareness Training Programme – A programme of awareness training for staff will be rolled out, including: Deaf Awareness, Visual Awareness, Dementia Awareness and Basic Sign Language. Charter Award – A number of Council Arts Venues will apply for the Arts and Disability Equality Charter to recognise the dedication and efforts to make venues as accessible as possible. The venues will be following on from the Strule Arts Centre which has received the highest, ‘Plaque of Excellence’ Award. Mystery Shopper Evaluations – Arts and Heritage Venues will have mystery shopper evaluations carried out by volunteers with disabilities to help identify areas that can be improved.